Like meeting your spouse on the Internet, earning a degree online went from unthinkable to mainstream in a few short decades. Despite their well-documented scandals, we have for-profit universities to thank for popularizing online learning. They pioneered online degree options, and while enrollment in online degree programs at for-profit universities has dipped, overall online enrollments are up thanks to their growth at public and nonprofit universities. We wanted to understand the emergence of online options at universities with long histories of on-campus instruction. So, using data from the U.S. government's Integrated Postsecondary Education Data System (IPEDS), we looked at recent changes in the availability of online degrees at nonprofit 4-year colleges and universities. We found that the number of four-year schools with online degree programs rose significantly. Among top-ranked schools, nearly 75% offer online degrees, and about half are increasing their online degree offerings. The fastest adopters of online learning include both public and private colleges and universities, including some academic heavyweights like Harvard and Johns Hopkins. Online degrees are most commonly offered in fields like business and health, which have long been popular among distance learners. But they are increasingly common for other fields like education and engineering. The craze over Massive Open Online Courses, which led some enthusiasts to prophesize the decline of traditional universities, has died down. But our analysis suggests that traditional universities are steadily embracing online courses. We began our analysis by examining how many schools offer at least one online degree program. We only looked at nonprofit colleges and universities in the U.S. that primarily award bachelor's degrees — a set of 1,844 institutions in total. We focused on the time period between 2012, when the government began to collect comprehensive data on online education, and 2014, the most recent year for which a complete dataset is available. Of these 1,844 schools, 46% had at least one online degree program in 2012. That figure jumped to nearly 60% in 2014. Between 2013 and 2014, online course enrollment increased nearly 4%, which suggests that schools are adding programs to meet student demand for distance learning options. 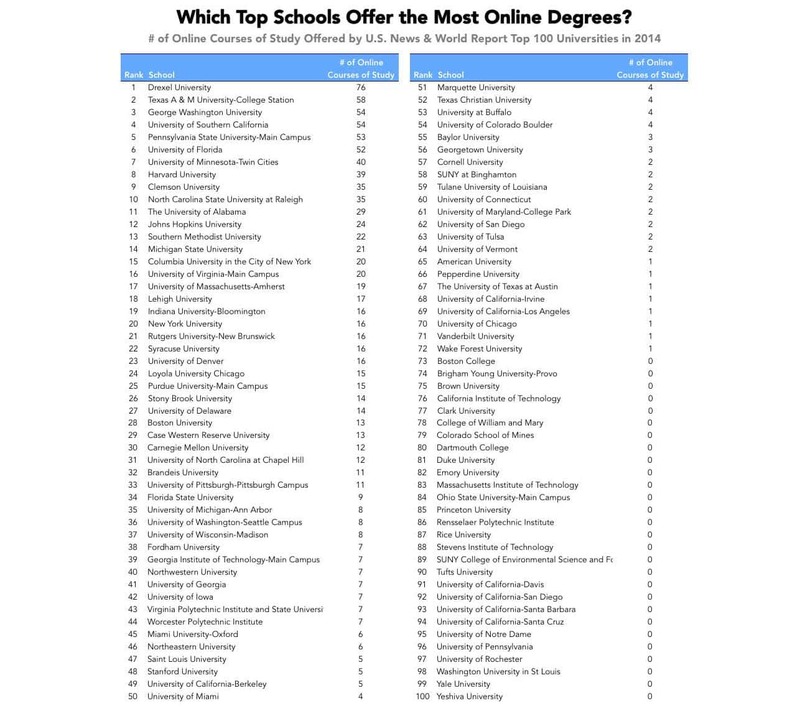 We also wanted know which schools offer the most online degrees, and which are adding degrees the fastest. We were specifically interested in top schools with long histories of high-quality, on-campus instruction. Are they embracing online learning, or sticking with tradition? We gathered data on the number of distance education programs at the top 100 universities as determined by U.S. News & World Report, and ranked the schools by the number of online courses they offered in 2014. This ranking show that distance learners don't have to compromise quality: of the 100 top schools, nearly 75% offered at least one online degree program in 2014. Together, they offer 1037 online courses. Just over half of the 20 schools with the most online degree programs are public universities — online education is well-suited to help state schools carry out their mission of increasing access to education. But online education isn't only for public institutions, as 9 of the top 20 schools on this list are private universities. Three of them — Harvard, Columbia, and Johns Hopkins — rank among U.S. News & World Report's top 20 universities, indicating that learners can now earn online degrees from among the most prestigious schools in the world. We were also interested in identifying which schools are growing their online degree programs. To do this, we ranked the same set of 100 top schools according to how online degree availability changed between 2012 and 2014. 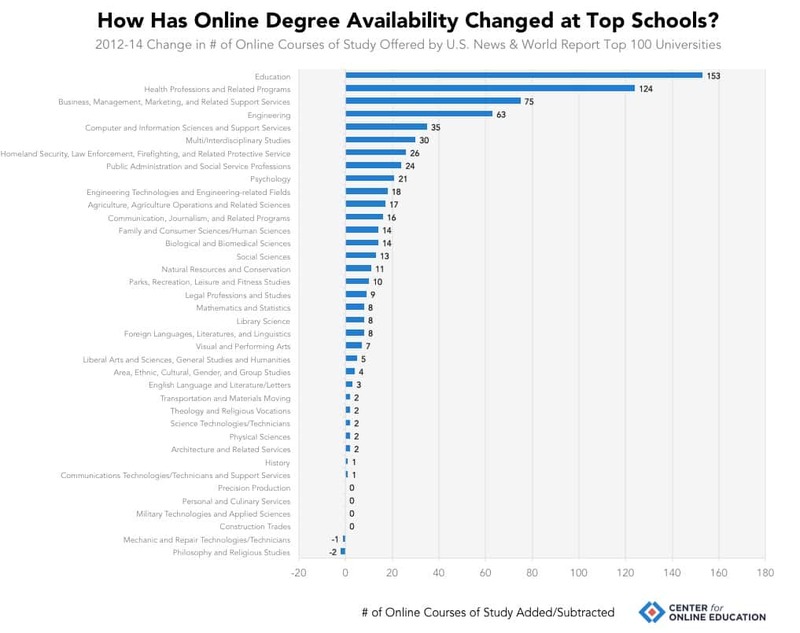 Our analysis shows that just under half of the top 100 universities are growing their online degree offerings. The program at North Carolina State University at Raleigh grew fastest, adding 34 distinct courses of study in just two years. At the other end of the spectrum, 14 schools offered fewer online courses of study in 2014 than they had in 2012. 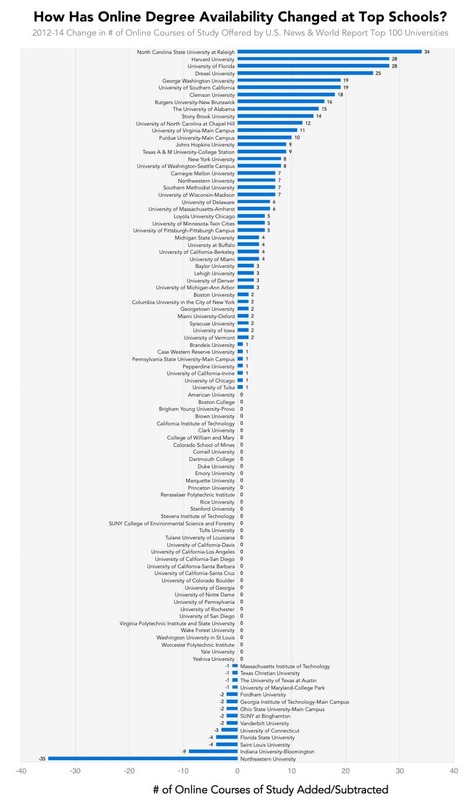 While this may indicate a shifting of priorities away from online education, it doesn't mean these schools aren't involved: Northeastern University, which has cut the most programs according to the IPEDS dataset, still offered 60+ online degrees as of 2016. Online education is growing even faster at large universities. We were able to obtain data for 93 of the 100 largest schools by undergraduate enrollment, and we found that 83 of the 93 had at least one online degree program, and that the majority grew their online course offerings. This is not surprising, given that many of the largest schools are large precisely because they've committed to online education. Liberty University, for example, has more than 110,000 students across all its degree programs, 95,000 of whom are online learners. At the top 100 liberal arts colleges, however, only four — St. John's University, the University of Richmond, St. Thomas Aquinas College, and Willamette University — offered any online courses of study in 2014. This is likely owing to the liberal arts emphasis on providing intimate learning experiences. Online education is increasingly common, but is it limited to specific courses of study like business administration? To find out, we pooled the U.S. News & World Report top 100 universities and top 100 liberal arts colleges, as well as the largest 100 universities, generating a list of 263 schools. (There is some overlap between the rankings.) We then tallied the number of courses of study they offered in each of 38 subject categories used by IPEDS. Business has long been the most popular major subject for online learners, but our data show that, among major universities, education trumps business with respect to program availability. Of the 263 schools we considered, 75, or just over a quarter, offered online courses of study in education in 2014. This is a category that includes training programs required for teacher certification, as well as education administration programs. The second and third positions go to health professions, which include nursing and healthcare administration, and business. Both are distance learning staples. Engineering and computer and information sciences round out the top 5. The availability of online courses of study in these fields is good news for distance learners: these specializations dominate the list of best-paying college majors. The second and third positions go to health professions, which include nursing and medical administration, and business, both distance education staples. Engineering and computer and information sciences round out the top 5. The availability of online courses of study in these fields is good news for distance learners: these specializations dominate the list of best-paying college majors. We also wanted predict which fields may account for a larger share of the online degree market in the future, so we examined trends in program growth between 2012 and 2014. We again focused on our sample of 263 large and/or highly ranked schools. 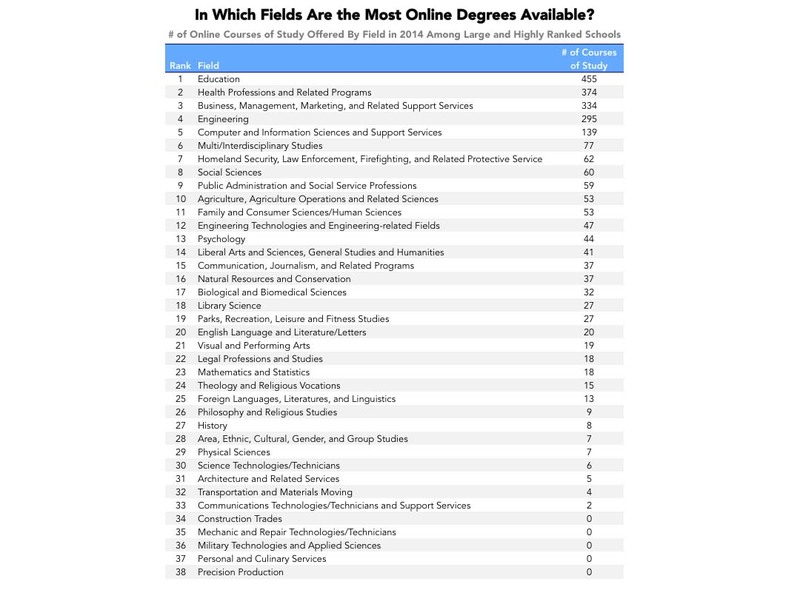 Online degree offerings increased in 32 out of 38 categories, which suggests that the range of specialization options for online learners is expanding. There was a net decrease in online degree availability in only two fields: philosophy and religious studies, and mechanic and repair technologies. The top five fields for growth are identical to the top five for program availability: education stands at the top of the list, followed by health professions, business, engineering, and computer and information sciences. This suggests that the breakdown of online degree programs by discipline is unlikely to change substantially in the foreseeable future. That said, fields that have long been inaccessible to distance learners saw modest growth. Specializations like visual and performing arts are increasingly available to online students thanks to technological advances that permit a high degree of interaction. As such advances accumulate, these programs may come to account for a larger proportion of online degree programs. So, in an age when more than a quarter of higher education students take at least one online course, are established universities adapting? Our analysis suggests that many large and prestigious universities are embracing online degrees. Well over half of all nonprofit, four-year colleges and universities offer at least one online course of study. While liberal arts schools remain an exception, elite schools like Harvard and Johns Hopkins are expanding their online degree offerings. The range of disciplines online students can study is broadening too. Colleges offer online degrees in fields that have long been served by distance study, like business and health professions, but also in specialities like biological sciences and visual and performing arts — subjects that once seemed impossible to learn from a distance. Daphne Koller, CEO of the online education platform Coursera, routinely makes headlines when she suggests that online degrees will become commonplace. But our analysis shows that future may already be here. The headlines — and our conception of what higher education looks like — just needs to catch up. 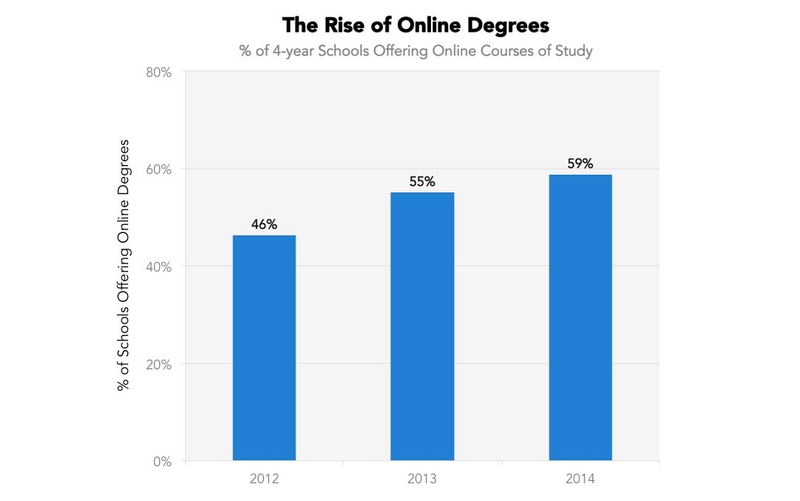 We looked at recent changes in the availability of online degrees at nonprofit 4-year colleges and universities, and how more schools are growing their distance learning opportunities. The transition to college is difficult for children and parents alike. Do you know how to support your young student before, during, and after college? Is an online education right for you? From technical requirements to personality traits, see what you’ll need to become a successful eLearner. Earning credits before you attend college can lower the cost of your education and improve your chances of graduating on time. Students from all backgrounds can earn college credits and work toward their degree.